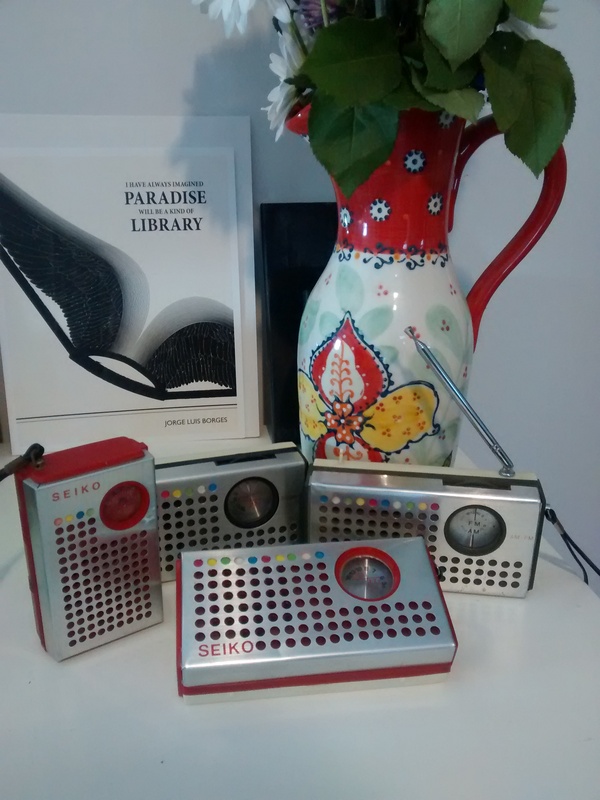 I have this obsession with these very specific 1960s Seiko solid-state radios. The design is a rip-off of the Sony mdl TR-4100. Stewart stole the same design. I have two red and two green. I have one antenna between all of them (only one of the greens was designed to have one), and both reds and one green are AM, while the other green is AM/FM. The thickness of the lettering does change on different versions; you’re correct. One green is missing the wrist strap, and, coincidentally, doesn’t work at all. Recently, the kids broke into my office and when Bob wandered in later he heard a low crackling hum and an old man whispering about a vengeful god. The kids had managed to switch on one of the AM radios and terrify the adults in the house, all in one fell swoop. I am so proud. 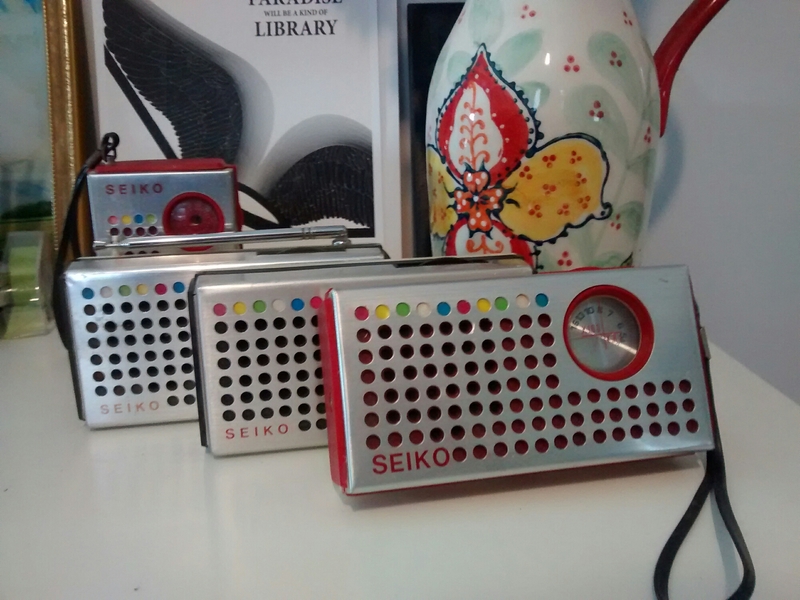 These radios are cheap, both to find now, and in quality. They were manufactured in Hong Kong by a company called Dreamland Electronics. The Sony models were manufactured in Tokyo by Sony. The Sony version is the higher quality one (only marginally), but I found my first Seiko (the one with the antenna) in a cluttered old antiques shop, converted from a farm house, in the middle of a field in the middle of nowhere, outside Canandaigua, New York. So I’m partial to the illegitimate knock-off (but not the Stewarts; no one likes those – ignoring that my AM green is co-branded Stewart, but really it’s my least favorite of the four). I’ve seen original boxes with what looks like a yellow version, but I think the blue has just faded out of the image. This little covey sits on my desk, pretty near the spot I photographed them. I accept that they are kitschy and a design that some people find mystifyingly off-putting. But I love their little (and big) irregularities, their fading plastics, their dented aluminum faces. What I should really do is figure out a way to play Rdio through one of them – preferably a non-working one. I think I still have an old iPhone I could jimmy in there… hmm.